It also enables us to change the master page from within the sitecollection properties. The next thing to do is to copy the existing master page. From within Sharepoint Designer you can go to the Master Pages section and copy the v4.master in the same folder and rename it to whatever you want. I generally choose the clients name. Tip! In the folder you also find a default.master and a minimal.master file. The default.master is the old 2007 master page. The minimal.master is a master page with only the base controls, no layout whatsoever. I always use a copy of the v4 master page and not the minimalistic one, because it’s more efficient to tweak the existing master page instead of creating a new one based on the minimal.master. We also want to apply our own custom stylesheet to the masterpage so let’s create a stylesheet. Go to the folder Common FilesMicrosoft SharedWeb Server Extensions14TEMPLATELAYOUTS1033STYLESThemable and create an empty mystyle.css file. 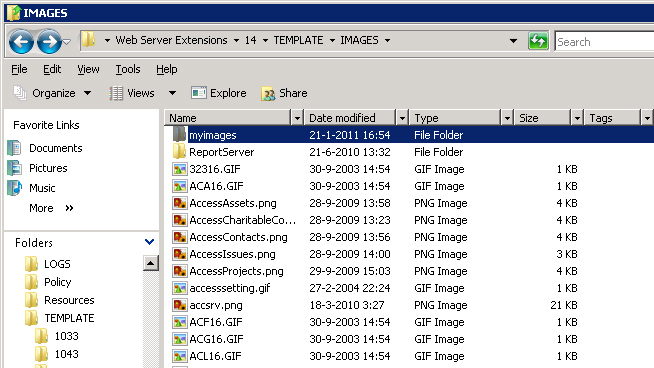 Now create a new folder inside the Common FilesMicrosoft SharedWeb Server Extensions14TEMPLATEIMAGES named myimages. Tip! We create a new folder to keep our images separated so they won´t be mixed up with the ones that come with Sharepoint. Another reason is that future editing would be easier because our images are easier to find, naturally. We are going to prepare our master page to use our custom stylesheet. just before the </head> tag. Then save the file and accept the warning for the customized page. The After=”corev4.css” ensures that the style elements in our custom stylesheet override the default css. In this example I’m going to change the color of the selected ribbon header from it’s dark grey to a solid blue color. 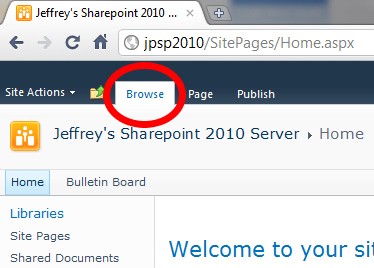 Now browse to the sharepoint page and check the html source to find out which class is being used by the selected ribbon header. In my example the class for the header of the selected ribbon is .ms-cui-tts > .ms-cui-tt-s > .ms-cui-tt-a > .ms-cui-tt-span (do you wanna know how to find these style classes easily? Check the next tip). Now we go to our mystyle.css and create this class here and give it our blue color style. Tip! I highly recommend the usage of developer tools for your browser. I always use Google Chrome with the built-in developer tools. They are very accurate and easy to use. In Chrome, rightclick the item you wish to know the style from and click Inspect element. At the right side of the window you find matched CSS Rules. You can copy a CSS rule and paste it in your mystyle.css and tweak it the way you want it. Now we wan’t to test our new master page. Before we can do that we need to select it with the master page picker we installed in the first step. Go to your sitecollection settings and go to the Master Page Picker which can be found under the Look and Feel category. Our new master page will be displayed in the list, select it and click ok to apply our new master page to the sitecollection. Now go to the site and check our result. The selected ribbon header text color is now blue, thumbs up! Tip! It may be difficult to find the hover style of some elements. In Google Chrome you can do this by rightclicking the item and leave your cursor where it is and browse the menu with up and down keys on the keyboard, then select Inspect element and press enter. At the rightside of the window you now find the classnames for the hover of the item. Some readers ran into an error when using their new master page. The error reads The expression prefix ‘SPUrl’ was not recognized. Please correct the prefix or register the prefix in the section of configuration. This is because SharePoint Foundation doesn’t support the SPUrl prefix out of the box. Nice post, the only problem with this approach is that you need access to the file system which is not always possible. Entirely true, but I guess in that case, you can put the images and stylesheets in a document library on the root site and refer to that from the masterpage. Nice post although sometimes you don’t have access to the file system so this wouldn’t be the best method in that scenario. The expression prefix ‘SPUrl’ was not recognized. Please correct the prefix or register the prefix in the section of configuration. At what step do you receive this error? Hey, thanks for the reply. I get this error when trying to load the webpage back up in internet explorer. I tried doing this as well and I got the exact same error as Steve did. I got it when I had added and deployed the solution and once I had clicked OK when taking the new master page into use via the Master Page Picker. The problem is not only that the front page of the service won’t open. The problem is that the only page that doesn’t render the same error message is the Site Settings page. For instance even the Master Page Picker now gives the same error message so I can’t even switch back to the old v4.master. thank you so much for the quick answer. That helped and now the new master page works like a charm. No problem, I’m glad I could be of help. I could deploy the new master page picker and put some stylings. I created a second site and ticked the “Apply to all sites?” to see whether the 2.nd site can now have the same look as the first site. I cannot see any difference. How do you apply the new master page? Once on the main site or every time go to site settings when a new site created and tick “Site collection” in “master page picker”? 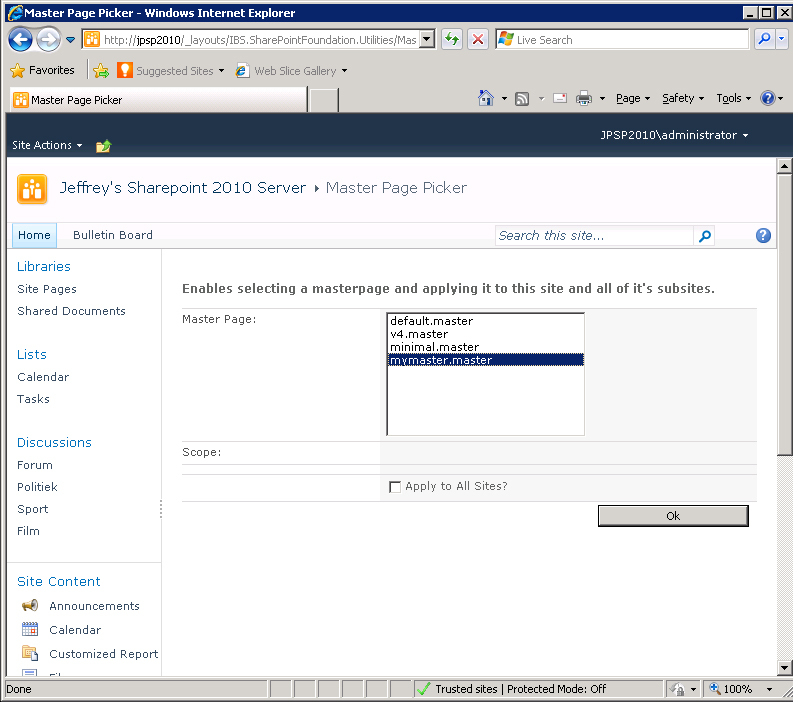 Out of the box it isn’t possible to apply your custom master page to all future sites. Luckily enough there is a solution to get the new master page automatically in your newly created sites. This can be done without the use of Visual Studio. I am going to write a blog post now, so it will be online in few hours. I will notify you when it’s online. Hi jeffreypaarhuis, I need some guidance or example that how to deploy a asp.net master page developed in visual studio to sharepoint. Maybe you can give me some context. What are you trying to accomplish? Note that there’s a big difference between the normal asp.net and the SharePoint master page. I don’t exactly know what you mean, but I guess it’s how you can use an image in an application page. If thats the case then the answer is pretty simple. You can still use the same /_layouts/images/CustomMaster/image.png because that is the path where the image resides, no matter what location the page you are making is on. very nice article and thanks. Would you please suggest how i can set this master page to only one site page only (webpart page i.e. test.aspx)? i dont want to apply customized master page to all sites but only one site page. Unfortunately, this solution can only be applied to site pages and not publishing pages, you need some code for that. No problem. Afterwards I indeed saw the solution applied to Foundation (I know, it was a while back) and for that doesn’t have publishing.